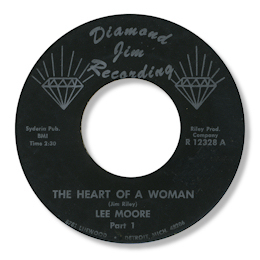 Detroit singer Lee Moore started out as the lead voice in Lee & The Leopards singing doo-wop. Their derivative Gordy release isn’t up to much, frankly, and it’s famous for being leased out to Laurie rather than the other way round. The Leopards included George Ross and Prentiss Anderson, who was also a member of Del-Rios in Memphis who included William Bell, Louis Williams of the Ovations and Norm West amongst their number too. 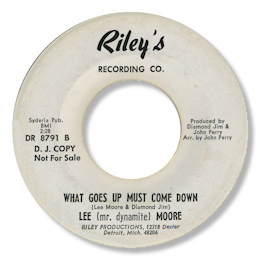 The Leopards only Fortune 45 moved the group into a more bluesy bag, a trend that Moore continued in his solo career. He cut first for James “Diamond Jim” Riley whose productions were much more hard edged and raw than the primped and often sanitised Motown arrangements, and on his two singles for Riley Moore was correspondingly visceral in his vocal approach. I am rather fond of the off beat two part “Heart Of A Woman” and even more in favour of What Goes Up Must Come Down with it’s bluesy feel. Moore’s falsetto phrases on both discs are really great, and the way he barks out “Huh” on the latter title from time to time really sticks in the mind. 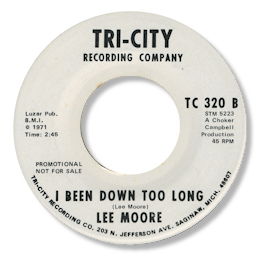 At the beginning of the 70s Moore worked with Choker Campbell for his Tri City label and in my view I Been Down Too Long is the best thing this fine vocalist ever recorded. A plodding beat, some strong horns and some tasteful licks from the pianist provide a firm foundation for Moore’s gruff tones. A very strong beat ballad. Note ~ The Gordy 45 can be found on the appropriate volume of the Complete Motown Singles CD sets.